Ever think of ways to improve your business and get people around Chicago to notice you more? Things will improve if you put yourself out there. 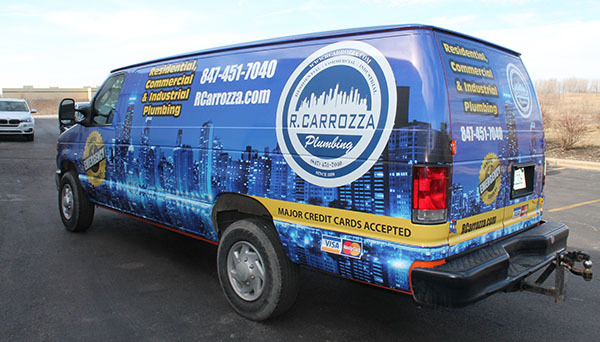 Vehicle wraps are a great way to call people's attention giving the city a much bigger view of what you have to offer. There’s no doubt your moving business will stand out more than others. Wrap your vehicle to attract in a way like never before. Don’t wait any longer to get the attention your business needs. Contact us or call (630) 289-7082 now. Get top quality Chicago vehicle wraps to improve brand awareness. Contact us or call at (630) 289-7082. For starters, once your car, truck or van is wrapped, there’s nothing else you have to do but drive. Your presence around town will start to call people’s attention giving them a nice feeling of familiarity. Plus, whenever in need of your service they’ll call you right away. The street is a place where people must pay attention to their surroundings. They stop and look around, and many times they’re thinking of things they need. That’s when the magic kicks in since you’ll be passing by with the perfect solution to their problem. And they didn’t even have to look for it! The key to all this attention calling is having a well designed presentation. Color, design and easy to read information are what people like. You need something that gets noticed but isn’t overwhelming. Your brand message should be seen on all sides of your vehicle and should be simple and direct. There’s no need to overload the information - just be sure to use specific words and text sizes to emphasize what you’re offering. Have your own style and be original. Also be sure to provide ways for people to contact you easily. The growth of your business and client trust are important. to you. You don’t want something that will quickly fade away and even worse, look cheap. The quality of your wrap is definitely important if you want a consistent and effective advertisement. If you invest in quality material, you’re definitely getting your money's worth. The best vehicle wraps are good to go for at least eight years! Don’t keep the people of Chicago waiting anymore. Show them what you’ve got by getting your vehicle wrapped with the best. Contact us or call (630) 289-7082 today!